This page may take a while to load- please be patient! 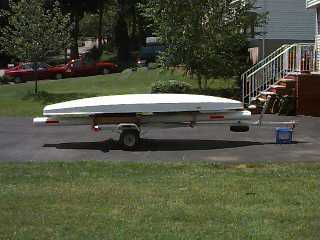 When I decided to get a Sunfish I wanted to build a good trailer that would hold the boat correctly and would last through a couple of Sunfish. 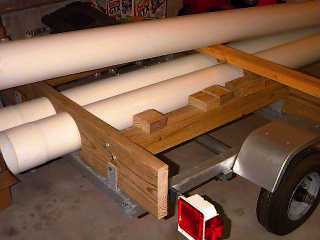 Here is the beginning of the project-- I have the initial cross sections in place and my holes for the tube are cut out. I used a saber saw to cut out the holes. Note- The long tube on top has to be cut and spiced into the other two tubes to provide enough length for the boom, gaff and mainsail. I used 3M 5200 for the bonding. Watch that stuff- it smears easily and will bond totally permanent. Once set- THAT'S IT! 1) When you set up the cross sections- measure your fish and where the cross sections will intersect the hull. On mine (an older 1974 model) the cross section supports the boat correctly but will not allow the mainsheet block to be permanently attached. I have solved this with a quick release pin to hold my large Harken Hexarachet onto the eye strap. 2) Consider if you want cleats on your boat. This can impact your placement of the cross sections. If I placed cleats at direct right angles to your hexarachet they would impact the font cross support. I am planning to put the cleats forward of that position. 3) When using 2 smaller ( 6 inch diameter) tubes instead of the original 1 eight inch tube be prepared to add a couple of minutes to your rigging time. You must take the hoop off of the gooseneck in order to have the spars enter the tube. I have used a large crescent wrench and have had no problem putting the gooseneck together. 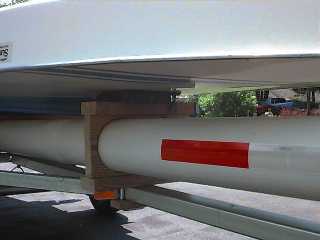 Some sailors have suggested cutting a slit in the tube for the gooseneck hoop to stick out. I have elected to remove the hoop. If you are still interested-- read on. Here is a view from the back. You can see the two lag bolts that connect the 4 X 4 to the 2 X 8 cross support. I used the 2 X 8 instead of the original 2 X 10 in the Mark I for lower center of gravity, better windage and because I didn't need the extra clearance for the 8 inch tube. All lumber is pressure treated wood. The near tube shows the flange that the top tube inserts to to create the long tube. This particular trailer is a galvanized "LONG" trailer. Although for ultimate utility (avoiding damage in the yard) the trailer lights should be mounted on the wooden cross supports (this involves grounding each light to the trailer)- I opted to leave them where they are because the trailer is new and the lights WORK! Forward of the wheel you can see the cross support that will be sawed per the plans in order to bend and conform to the hull. This is the only wood NOT pressure treated. A major departure from the original design is in the mounting of the forward mast step support. 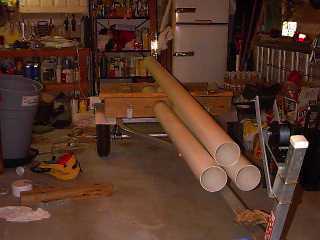 Since the 6 inch tubes are much lighter and less rigid that the original 8 inch tube, I built a support using part of a 2 X 8 with holes sawed out which provides support for a carpeted pad for the area around the mast step. There are a lot of small lag bolts here- some counter sunk [from the carpet board to the 2 X 4, from the 2 X 4 to the 2 X 8,and from the bottom 2 X 4 to the two by 8] The piece is attached to the trailer with a U bolt which comes from the bottom side and attaches to the bottom 2 X 4- This is counter sunk to the bottom 2 X 4 so that the 2 X 8 can fit flush on top. (note: This engineering took me a couple of hours of head scratching and a couple of hours of measuring before I started to actually cut and drill- You application will probably be better and be easier to build!) I have used the 5200 between the tubes and the 2 X 8 to bond them together. I also got some 3M Semi-Truck reflectors and put them on the tubes for added visibility at night. The finished product at a distance- The spare tire was mounted to provide enough tongue weight to keep the trailer tracking correctly. This doesn't show the tie down strap which goes over the hull forward of the bailer and the front tie down which relied on the winch being reversed and turned upside down. The bow rests against a standard bow stop. I used end caps for all 4 ends. They were expensive compared to the price of the tubes but made for a water tight seal. The front end caps were attached with the 3M 5200 and the back caps push on and off and are attached with a pin put through a hole drilled through both cap and tube. Make sure to dry your sail after transport! You could build up some major green stuff if stored wet! I stored my sail inside the tube last winter and it worked out well. NOTES-- Malcolm Dickinson contacted me and provided additional details and information. using wire mesh or rope to keep the spars in the tube, since that provides air circulation. 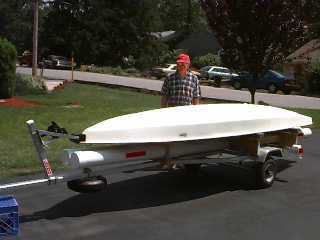 Harry League (active in IL and the northeast during 1990-1994) designed his custom double trailer with tubes that had large vent holes in the front as well as back, to facilitate air entering the tube and blow-drying the sail during highway travel. Have you considered making a cover, probably of small semicircular pieces of plywood, to shield your spare tire from the sun? If you store your boat outside in summer, you will find in about 2 years that the "up" side of your spare has begun to rot due to the UV exposure.